Since year 2000, FOTOCAT is an in-progress project owned and managed by Vicente-Juan Ballester Olmos, with the purpose to create a catalog of world-wide UFO photo events. Desde el año 2000, FOTOCAT es un proyecto en desarrollo dirigido y gestionado por su propietario, Vicente-Juan Ballester Olmos, para la elaboración de un catálogo mundial de casos ovni fotográficos. Physically, FOTOCAT is an Excel file of UFO and IFO cases where an image has been obtained on photo, film or video. It contains various data columns to register the date, time, location, province and country, explanation (if one exists), photographer's name, special photographic features, references, etc. When completed, the full catalogue will be posted in internet, for an indiscriminate access to the worldwide UFO community. Figure of 6,750 is the present number of entries in the catalog, an increase of 232 units since last April. We hope to arrive to the 7,000 mark by the next Blog's update. This section reports contributions received from new collaborators (or from regular ones which most recent contribution is considered outstanding). In addition to the new names cited here, many others are regularly contributing to the enlargement of FOTOCAT. We thank Nick Balaskas (Department of Physics and Astronomy, York University, Toronto, Canada) for his remarkable donation of three DVDs containing the files of Arthur R. Bray, donated in 1994 to the University of Ottawa, including the Project Magnet archives of Wilbert B. Smith who Bray had acquired from Smith' s widow and sons. Lots of correspondence between each one of the two researchers with many well known ufologists in the last decades and a large amount of other interesting items give shape to an impressive collection. A real documentary treasure, including many press clippings on UFO cases where pictures were obtained, in the process of being copied and cataloged. An overwhelming advance has been achieved with the compilation of UFO reports for Chile thanks to the assistance of Marcos González, of the Canopus group. Our gratitude also goes to Carlos Alberto Iurchuck (La Plata, Argentina), Jean-Pierre Troadec (OVNI-Investigation, Lyon, France), Anders Liljegren (Arkivet för UFO-forskning, Norrkoping, Sweden), Roderick B. Dyke (Archives for UFO Research, Washington, USA), and author Antonio Fontela Talín (Gijón, Spain), for specific pieces of information concerning photographic cases of all times. Few monographs entirely devoted to UFO photos exist, and we have kindly received one from Venda Jones, a Mississippi woman of 56 years old who claims she has the faculty to see UFOs since she was thirteen. Starting August 2005 she also began to take pictures of the "ships". In February 2006 she has published a booklet to convince others: They Hover Above Us (Author House, 1663 Liberty Drive, Suite 200, Bloomington, Indiana 47403, http://www.authorhouse.com ) With only 59 A-4 pages, it contains 132 color photographs, taken between August and September of 2005 in several locations of the neighboring states of Tennessee, Mississippi, Arkansas and Texas, roughly corresponding to 32 different sightings. Katy, Texas, august 2005 (photo by Venda Jones). Venda believes she is escorted by UFOs. "I don't have to look for them; they always seem to know where I am at. Everywhere I go I can see them. The sky is full of them" (personal communication, June 4, 2006.) For the book author there are both good and evil aliens, the US government and NASA has lied and deceived about UFOs, Roswell and Area 51. "I have seen these beings -she wrote to me- and the ones I have seen are very evil. There were the short ones peeping in my windows. Then the 8 ft. Tall ones came and tried to abduct me. Then they sent the ones with high authority. These are the 10-11 ft. Tall ones with wings on their shoulders. They are huge and smell awful, like rotten eggs. But the Lord God sent his angels and ran them off." Frankly, I have already a clear idea of the species of beliefs and mentality of this lady. From either the collector or the analyst's viewpoint, this little book is a disappointment, no useful data are provided on the events, not even complete dates, not hours, no data over a few words that you can use to catalog or study them. It is a disorganized, chaotic collection of largely enlarged quasi-stellar points of light in the night sky, moved by a camera handled by a person with a physical disability, bad knees and a jerking body. Sorry, Venda, this is not my cup of tea. This section will revisit certain UFO photographs from past decades with a new interpretation. UFO Footage or Science-Fiction Movie? Ufologist Hayden C. Hewes published an amazing article in the July 1972 issue of Saga -"the magazine for men"- which regularly covers the UFO scene, where it was narrated that an anonymous witness had filmed a sphere-shaped object crashing into the waters of the Pacific Ocean off Inglewood, in the coast of California, while in the beach at 06,30 hours a.m. of January 12, 1972. At least, this is how the reported story goes, one that was supported by a strip of pictures of the falling object. It was curious to note that this case was hardly mentioned in the UFO literature, as the sequence of pictures printed by Saga looked impressive. I therefore commented upon this case in the Sign History Group e-mail list, and soon two major experts provided responses. In a personal message, noted scholar of the UFO history Barry Greenwood wrote: "This footage was actually from the movie "This Island Earth" (1956). Someone must have taken screen shots of the movie and applied a false claim to it. I know because after having seen the article, I saw the film and was struck by the end where the alien ship crashed. It was identical to the stills from Saga". Also, Australian researcher and book writer Bill Chalker confirmed this to me. 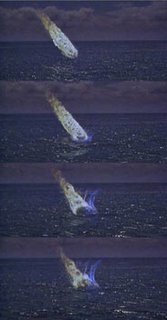 I downloaded the movie through e-Mule and I found out that the last seconds of the film precisely show how a large flying saucer, converted into a fireball, crashes into the ocean. The Saga series of frames belongs to 1:25:22 to 23 in movie watching time, barely one second of vision, and so easy to be neglected. But the eyes of our colleagues and friends are extremely competent. Also, some retouching has had place in the images as well. Thanks to the expertise of Heriberto Janosch for converting the CD film images into individual frames and into a video clip that we present here for comparison. By clicking in the mini screen below, you can watch a brief video clip showing the last few seconds of the movie, with the flying saucer crashing into the Earth' s ocean. The case is closed. In the first issue of the new Magazine 2001, a UFO periodical edited in Buenos Aires, in October 4, 1968, Alejandro Vignati devoted a full article to this affair, interviewing to several eyewitnesses (traffic controller, radiotelegraph technician, airline receptionist, and others). The article mentioned the rumor that an anonymous tourist had taken a photograph. In the first chapter of the book Historia de los platos voladores en la Argentina (A History of Flying Saucers in Argentina), published by Plus Ultra in 1976, Héctor P. Anganuzzi, I guess that copying from here and there, refers to "the existence of a picture by a tourist living in Rosario... but it is true that this was never printed". Then, it appears in the internet, in the web site of Argentinean researcher Luís Eduardo Pacheco, in a link that was discontinued, a detailed report which includes the photograph of a landed UFO in the airport facilities. Funny, the event is dated in 1974 instead of 1968, and it is indicated that the Argentina' s Air Force released on September 15 (1968) a communiqué recognizing that "the over flight of an unidentified aircraft over the Bariloche airport (was due to) a RB-57 Camberra aircraft belonging to the United States Air Force, doing scientific job operating from the El Plumerillo base..."
I do not pretend to support or refute the publicized official explanation. My only purpose here is to certify that the photograph associated with this occurrence is a hoax and it is entirely unrelated to any UFO sighting in this airport. 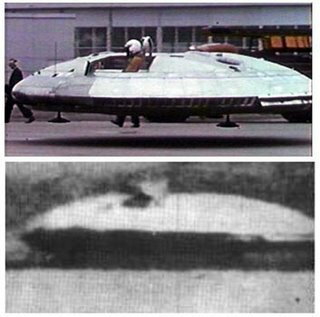 In fact, J. P. González, a member of the Anomaly Foundation, has found out that this photograph, after some lab manipulation, corresponds without any doubt to another identical picture of the…Avrocar, the Canadian flying vehicle shaped like a saucer unluckily tested and program-cancelled in 1961. (See: Hill Zuk, Avrocar: Canada' s Flying Saucer, The Boston Mills Press, Erin, Ontario, 2001). 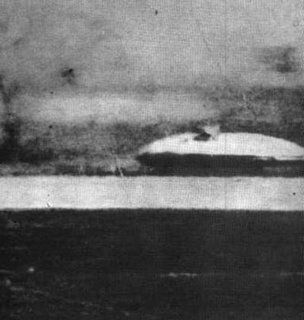 Later on, analyst Manuel Borraz worked out an image composition showing the absolute resemblance between the faked UFO and the Avrocar prototype. Let me finally provide some additional illustration on the experimental flight of the Avrocar. I am attaching a short video clip extracted from the TV documentary "UFOs: The Secret Evidence", © Oxford Film and Television Ltd. 2005. The assistance of Heriberto Janosch is acknowledged. Following the thread of the information, we now know that Pacheco had taken the episode photograph from Terror en la Luna, a book by Spaniard Juan José Benítez (Planeta, 1982, pages 255-258), he who -in turn- had copied text and illustration from a naughty source, an article by Argentinean journalist Marcelo Eduardo Pichel printed in the Mexican magazine Contactos Extraterrestres. At the end, we are able to find the first source for the fraud photo. This section will display one instance of UFO sighting directly reported to FOTOCAT, where the images that were achieved have no explanation at this stage. Thanks to the kindness of Robert Bernatowitcz, who is the leader of the Nautilus Foundation (Poland), a fascinating series of photographs has been received by the FOTOCAT Project. These five photos (many more were obtained) were filmed near the Polish town of Zdany, on the route to Miedzyrzed Podlaski and Terespol, on Sunday January 8, 2006, when T. Maciej (65) was driving home a friend, named Zbyszek (60). They were returning from a wedding party at 12, 30 hours. Suddenly their car stopped without any reason (the driver being a mechanic by trade), as well as another minibus with a Russian plate that came just behind. The two automobiles were halted for some 20 minutes in which interval, for some 8 minutes, they could see the movements of a nearby object at the time that a great wind was blowing. Although entrance to our catalog stops in December 31, 2005, I am presenting the sequence of 5 available pictures here for your inspection and comment because they look pretty amazing. By inserting them here I am trying to stimulate discussion. Any opinions will be included in the September 2006 update of this Blog. The UFO brightness is consistent with the top being illuminated by the sky, while the bottom is illuminated by the snow, which in turn illuminated by the yellow sun and blue sky (for a white result). There is no evidence of a supporting string. This case is clearly a fake or an unknown. The UFO is reflected in the car hood in one of the photos. The UFO is split in half but the tree-line is too. The curvature of hoods is usually uneven, but the UFO is in approximately the expected position. The ground appears to be reflected on the bottom of the object. There are indications to estimate the UFO diameter in 1 foot wide (witness claims 2 meter in diameter, or 6 feet), and it is from 32 to 55 feet away. The photographer seems to be reluctant to cooperate with the public. He seems to be an engineer and he might have skills in digital manipulation. Or the object could be a balloon. Or a spacecraft for dwarfed ETs or a drone for data acquisition, who knows. We promise to update you when new information is available and a final analysis is done. Some basic statistics derived from FOTOCAT. FOTOCAT records all events initially defined as UFOs in every photographic type, the picture category with the photograph still (standard negative), slide and digital picture, the category of film, cine or movie, and the category of video. The table below summarizes the catalog content divided by these 3 categories, according to its known classification of UFO or IFO. We see that 75% of all cases on file are photographs, films only represent 4% of total, and videos are 21%. Presently, pictures (digital and analogical) continue to be taken, in spite of the popularity of the domestic camcorder recordings, but cine cameras are already inexistent since the end of the eighties. The percentage of explained cases hardly differ whether we consider photos or films (between 37% and 41%), but this percent decreases a lot when we handle video reports (24%) , probable because this mode being much more recent in time, video recordings have not subjected to massive analysis unlike more classical filmed evidence. Where regularly we will include any published literary piece on curious phenomenology. This is a brief item report for the serious and critical-minded UFO researcher. Some selected information sources which I judge of interest for gaining knowledge from a scientifically-oriented perspective. 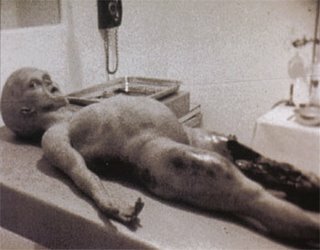 Everybody is aware of the alleged autopsy film practiced on a small, asexual and bellied alien being, which was projected in many TV shows all over the world in 1995. It was a 91-minute silent movie that was well marketed by London-based video distributor Ray Santilli, one that become material for avid comsuption for sensation-seeking magazines, whose directors accepted blindly the reality of the disection scenes to an extraterrestrial or -in the best of cases- were timidly critical with the black and white, grainy, mute film that was purportedly showing the improvised operation made in 1947 to one of the humanoids allegedly found near the UFO crashed in the desert near Roswell, New Mexico. Because Roswell has been in the last decades, beside other non-events like the Majestic 12 group, one of the themes that has wasted more ink in the underworld of ufology, with the espenditure of huge amounts of time to researchers, both gullible as skeptics alike. In fact, one of the reasons of the evident lack of advancement in the UFO subject is, precisely, the deplorable loss of time, energy and resources in fancy debates like this. There we listen how the father, described as a "pilot in the Air Force", defines the sighting as "incredible". What it is incredible, in reality, is that this citizen is not aware that in the town where he lives, year after year, justified by the festivities on Saint Judas Tadeo, hot air balloons are launched in the night that gain height thanks to the flames produced by the combustion of the petroleum-impregnated oakum. Around the balloon some wires hold a crown of lights that make a nice sight. 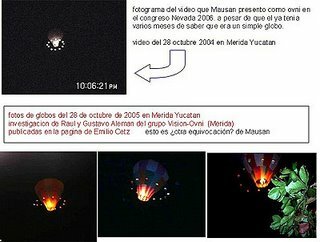 Local investigators Raúl Alemán, Gustavo Alemán and Emilio Cetz, from a UFO organization called Visión-Ovni, did a inquiry to verify the nature of the object appearing in the video take. Findings, by the way, which were personally checked and confirmed by Mr. Maussán in the anniversary of the video, on October 28, 2005. I thank Carlos Martínez by the information supplied. I am sure this display will be familiar to ufologists, amazed by other videos showing the flying of flocks of reflecting, round UFOs over the skies of Mexico. William K. Hartmann, "Analysis of UFO Photographic Evidence", in Daniel S. Gillmor (editor), Scientific Study of Unidentified Flying Objects (E.P. Dutton & Co., Inc., New York), 1969, pages 84-85 and 437-455. Ann Druffel, Firestorm: Dr James E. McDonald's Fight for UFO Science (Wild Flower Press), 2003, pages 271, 287-309 and 322-324. Ann Druffel, The MUFON UFO Journal, January 2006, cover and pages 3-7; and February 2006, pages 3-9. If you do not have the special 3-D glasses, here you have cross-eye stereo pair that you can "free view" and see in 3-D without the need of the red and blue glasses. The problem here is that, as Tim explains: "...when it was seen in stereo it would appear to be small and up close, rather than big and distant". This finding has arisen again a -still unfinished- high-quality, highly laudable controversy in the UFO Updates list. I expect that it is for the sake of good ufological practices. Ann Druffel, the veteran ufologist from California, wrote to me to confirm that she is in possession of the originals: "Rex Heflin entrusted them to me shortly after he received them under unexplained circumstances in the 1990s", she said. (Apparently, three of the photographs had been stolen to the photographer, to reappear 28 years later as mysteriously as they had disappeared in the beginning). This is a case open and full of merit for renewed scientific evaluation. On June 5, 2006, Karl T. Pflock passed away in his home of Placitas, New Mexico. For months, Karl was ill with the rare, fatal ALS sickness. Though I was well aware of Karl Flock' s writings in ufology, our venues did not cross until 1995, when I wrote him for the first time, to happily read these initial lines of his first letter to me on September 13, 1995: "Of course I'm familiar with your significant and most interesting contributions to UFO research". This mutual familiarity and respect took us to a nice exchange of correspondence, first, and emails, then, until few months before his ultimate death, which include sound judgments and reviews about persons and situations that incidentally tied us together in this interval. I do not plan to write a classical obituary here, just an excuse to re-read our letters, recall a couple of things and mention some of his recommended bibliography. 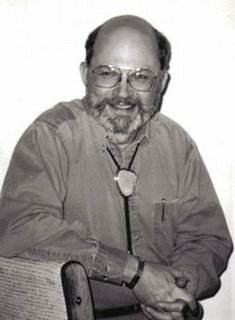 Firstly, the fact that we was a CIA professional employee for 6 years made him victim of insinuations about a possible non-clean approach to UFOs, undercover activities and the like, which he tried to dispel with good sense of humor, with articles like "I was a ufologist for the CIA" (UFO magazine, November/December 1993, pages 25-30, or by requesting the Central Intelligence Agency' s Office of Personnel to certify in writing that his employment with the CIA started September 11, 1966 and ended March 31, 1972! (enclosure). Pflock was an strategic analyst, a very intelligent person and a careful researcher and writer. He wrote extensively on Roswell and his last report is a master piece: Roswell. Inconvenient Facts and the Will to Believe (Prometheus Books, Amherst, New York), 2001. He surely must have had a lot of fun while collaborating with James W. Moseley to coauthor a book entitled Shockingly Close to the Truth! (Prometheus Books), 2002, sort of a book of memories of Jim and also an amusing text for students of popular culture. Karl: we will miss your insights and detailed analytical examinations of things ufological. We will supply you with state, regional, provincial or national catalogs for you to check and enlarge. Físicamente, FOTOCAT es un archivo de Excel de casos OVNI y OVI en que se ha obtenido una imagen en fotografía, película o vídeo. Contiene diversas columnas de datos para registrar la fecha, hora, lugar, provincia y país, explicación (si existe), nombre del fotógrafo, características fotográficas especiales, referencias, etc. Cuando se haya completado, el catálogo completo se hará accesible desde Internet para la libre consulta de toda la comunidad ufológica mundial. La cifra de 6.750 representa el número actual de casos recogidos por el catálogo, el cual ha incorporado 232 unidades desde abril pasado. Esperamos llegar a los 7.000 informes en la siguiente actualización del Blog. Esta sección recoge las contribuciones recibidas de nuevos colaboradores (o de otros ya habituales cuyas recientes aportaciones sean relevantes). Además de los que aquí se citan, muchos otros investigadores siguen contribuyendo regularmente al crecimiento de FOTOCAT. Quiero dar mis más expresivas gracias a Nick Balaskas (departamento de Física y Astronomía, Universidad de York, Toronto, Canadá) por la notable donación de tres DVD que contienen los archivos de Arthur R. Bray, donados en 1994 a la Universidad de Ottawa, que a su vez incluyen los archivos del Project Magnet de Wilbert B. Smith, una figura legendaria de la ufología canadiense, que Bray había adquirido de los familiares de Smith. Son carpetas y más carpetas de correspondencia de los dos investigadores con muchísimos ufólogos bien conocidos de todo el mundo en las últimas décadas, junto a un gran número de otra documentación de enorme interés. Un auténtico tesoro documental, que incluye numerosos recortes de prensa sobre casos fotográficos, que han sido copiados y que en breve serán oportunamente catalogados. Estamos a las puertas de llevar a cabo un significativo avance en la recogida de informes ovni de Chile, gracias a la ayuda que no viene brindando Marcos González, del grupo Canopus. Damos las gracias a Carlos Alberto Iurchuck (La Plata, Argentina), Jean-Pierre Troadec (OVNI-Investigation, Lyon, Francia), Anders Liljegren (Arkivet för UFO-forskning, Norrkoping, Suecia), Roderick B. Dyke (Archives for UFO Research, Washington, EE.UU.) y Antonio Fontela Talín, licenciado en Geografía e Historia y escritor (Gijón), por remitirnos informaciones relativas a casos fotográficos de todos los tiempos. No hay muchos libros dedicados exclusivamente a exponer fotos de ovnis; el más reciente lo hemos recibido amablemente de su autora, Venda Jones, una mujer de 56 años de Mississippi que afirma ver ovnis desde que tenía trece años de edad. 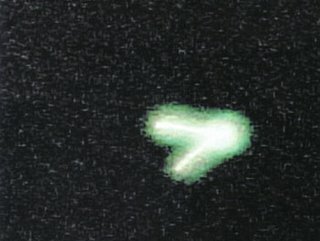 Además, desde agosto de 2005 comenzó también a tomar fotografías de las "naves".El pasado febrero publicó un opúsculo editado para convencer a los incrédulos, titulado They Hover Above Us o "Ellos se ciernen sobre nosotros" (AuthorHouse, 1663 Liberty Drive, Suite 200, Bloomington, Indiana 47403, http://www.authorhouse.com) Sus 59 páginas en tamaño A-4 contienen nada menos que 132 fotos a color, tomadas entre agosto y septiembre de 2005 en distintas localidades de los estados vecinos de Tennessee, Mississippi, Arkansas y Texas, que se corresponden aproximadamente con 32 avistamientos. Katy, Texas, agosto de 2005 (Foto por Venda Jones). Venda se cree que es seguida y perseguida por los ovnis. "No tengo que buscarlos, ellos siempre parecen saber donde estoy. Allá donde voy, puedo verlos. El cielo está lleno de ellos" (carta personal del 4 de junio de 2006). Para la autora, hay alienígenas buenos y diabólicos, el gobierno de los Estados Unidos y la NASA mienten y engañan sobre los ovnis, Roswell y el área 51. "He visto a esos seres -me ha escrito- y los que he visto son muy malos. Eran los enanos que me escudriñaban a través de mis ventanas. Luego los de dos metros y medio llegaron e intentaron abducirme. Más tarde mandaron a los que tienen más autoridad. Tienen 3 metros y medio de altura y llevan alas en sus hombros. Son enormes y huelen fatal, como huevos podridos. Pero el Señor Dios mandó a sus ángeles y les hizo huir". Francamente, yo ya tengo una idea clara de las creencias y mentalidad de esta dama. Desde el punto de vista del coleccionista de documentos gráficos o del analista, el libro es decepcionante, ya que no hay detalles de los avistamientos, ni fechas completas, ni horas, ni datos que sirvan para su catalogación y menos su estudio. Se trata de una colección desorganizada y caótica de puntos de luz celestes casi-estelares grandemente ampliados sobre el fondo nocturno, sin otros puntos de referencia, movidos por la cámara de una persona que, debido a una incapacidad física, tiene temblores corporales y rodillas inseguras. Lo siento, Venda, pero no estoy por la labor. En esta sección se revisarán algunas fotografías ovni de pasadas décadas con una nueva interpretación. ¿OVNI filmado o cine de Ciencia Ficción? El ufólogo Hayden C. Hewes fue el autor de un intrigante artículo que vio la luz en el número de julio de 1972 de Saga -"la revista para los hombres"- en donde habitualmente se difunde información sobre el fenómeno ovni. Allí se narraba cómo un testigo anónimo había filmado un objeto en forma de esfera se estrellaba en las aguas del Océano Pacífico, no lejos de Inglewood, en la costa de California, mientras éste se hallaba en la playa a las 6.30 de la mañana del 12 de enero de 1972. Al menos, esa era la historia que se contaba y que era sustanciada por una tira de fotografías. Conocía este caso de antaño y siempre me pareció curioso que apenas se mencionara en la literatura ufológica, ya que la secuencia de fotos impresa en las páginas de Saga parecía impresionante. Así que se me ocurrió comentar este suceso en la lista de correo electrónico del Sign History Group y con prontitud respondieron dos conocidos expertos internacionales. En un mensaje personal, el gran conocedor de la historia OVNI y amigo Barry Greenwood me escribía lo siguiente: "Esta filmación procede realmente de la película "This Island Earth", de 1956. Alguien debe haber extraído fotos del film y les ha añadido un falso relato. Lo sé porque tras leer el artículo original vi la película y me asombró el final en el que una nave espacial extra-terrestre se hunde en el océano. Era idéntica a las fotos de Saga". Asimismo, el investigador y autor australiano Bill Chalker también me confirmó este extremo. Entonces, gracias al dispositivo e-Mule me bajé de Internet esa película para grabarla en CD, viendo por mis propios ojos que los últimos segundos de la película muestran como un gigantesco platillo volante, convertido en una bola de fuego tras entrar en la atmósfera de la Tierra, cae al mar. La serie de fotos publicadas en Saga se corresponde con los fotogramas 1:25:22 al 23 (en tiempo de visionado del film), apenas un segundo de tiempo que bien puede pasar desapercibido. Pero los ojos de nuestros colegas son extremadamente competentes. Además, parece que las imágenes originales se han retocado algo para ocultarlas. Agradezco la colaboración de Heriberto Janosch para convertir las imágenes de la película en CD en fotos individuales congeladas, así como en un video clip que presentamos seguidamente para que los lectores comparen. Pinchando en la mini pantalla siguiente, verás un breve video clip de los últimos segundos de la película de ciencia ficción, cuando el platillo volante se estrella en las aguas del planeta Tierra. Asunto resuelto. En el número 1 de la Revista 2001, de Buenos Aires, de fecha 4 de octubre de 1968, Alejandro Vignati dedicó un reportaje al asunto, entrevistando a varios testigos (controlador de tráfico, técnico radiotelegrafista, recepcionista de aerolíneas, despachadora de tráfico, etc.). Se rumorea que un turista anónimo había sacado una fotografía. En su libro Historia de los platos voladores en la Argentina (Plus Ultra, Buenos Aires, 1976), capítulo 1, Héctor P. Anganuzzi, supongo que copiando de aquí y de allá, habla de "la existencia de una fotografía de la máquina por un turista residente en Rosario…pero lo cierto es que jamás se publicó placa alguna". Seguidamente aparece en Internet, en la página web del investigador argentino Luís Eduardo Pacheco, en un enlace ahora no disponible, una extensa información al respecto, que incluye la fotografía del ovni aterrizado junto a las instalaciones del aeropuerto. Curiosamente el suceso se fecha el año 1974 en lugar de 1968 y se indica que la Fuerza Aérea argentina difundió el 15 de septiembre de 1968 un comunicado que informaba que el "sobrevuelo de una aeronave no identificada sobre el aeropuerto de Bariloche (se debió a) un avión RB-57 Camberra del escuadrón USAF que opera en tareas científicas desde la base de El Plumerillo…". Con independencia de cuáles fueron los hechos reales y su explicación o no, mi propósito aquí es certificar que la fotografía asociada con este evento es amañada y que no tiene ninguna relación con ningún avistamiento ovni en dicho aeropuerto. En efecto, J. P. González, de la Fundación Anomalía, ha descubierto que esa fotografía, a la que se ha sometido a una clara manipulación en laboratorio, se corresponde sin ningún género de dudas con otra idéntica…del Avrocar, el vehículo canadiense en forma de platillo volante probado con escasa fortuna y cuyo programa fue cancelado en 1961. (Ver: Hill Zuk, Avrocar: Canada' s Flying Saucer, The Boston Mills Press, Erin, Ontario, 2001). Posteriormente, Manuel Borraz realizó la siguiente composición que muestra la semejanza absoluta entre el supuesto ovni y el prototipo del Avrocar. Como ilustración adicional acerca del vuelo experimental del Avrocar, seguidamente incluyo un breve video clip, extraído del documental "UFOs: The Secret Evidence", © Oxford Film and Televisión Ltd. 2005. Agradezco la asistencia de Heriberto Janosch. Siguiendo el hilo de la información, sabemos que Pacheco había extraído la fotografía de marras del libro de Juan José Benítez, Terror en la Luna (Planeta, 1982, páginas 255-258). Éste, a su vez, usó una pésima fuente para copiar el texto y la fotografía, un artículo del periodista argentino Marcelo Eduardo Pichel en la revista mejicana Contactos Extraterrestres. Así que ya hemos dado con el creador inicial de la foto fraudulenta. Esta sección expondrá una muestra de los avistamientos directamente comunicados a FOTOCAT y cuyas imagines carezcan todavía de explicación. Ha sido gracias a la amabilidad de Robert Bernatowitcz, que lidera la Fundación Nautilus en Polonia que el Proyecto FOTOCAT ha recibido una fascinante serie de fotografías. Son cinco fotos (de las muchas que se tomaron) logradas cerca de la población polaca de Zdany, en el camino a Miedzyrzed Podlaski y a Terespol, el domingo 8 de enero de 2006, cuando T. Maciej (65 años) conducía a su casa a un amigo llamado Zbyszek (60 años). Ambos regresaban de las fiestas de una boda a las 12,30 de la mañana, cuando el automóvil se paró sin causa aparente (el conductor es mecánico de profesión), así como un minibús con matrícula rusa que iba detrás. Los dos vehículos estuvieron parados durante unos 20 minutos. En ese tiempo, y durante unos 8 minutos, avistaron los movimientos de un ovni cercano, al tiempo que sentían que soplaba un fuerte viento. Aunque nuestro catálogo termina el 31 de diciembre de 2005, he pensado en presentar esta secuencia de fotografías para la inspección de los lectores y para recibir sus comentarios, dado que son verdaderamente impactantes. Al insertarlas seguidamente trato de estimular una discusión en torno a esos documentos gráficos. Cualquier opinión recibida se incluirá en la próxima actualización de este Blog en septiembre de 2006. El brillo del ovni es consistente con una parte superior iluminada por el sol y una inferior por la nieve, que a su vez está iluminada por un sol amarillo y un cielo azul, dando un resultado en blanco. No hay evidencia de un hilo del que pendiera el objeto. Este caso claramente es un fraude o un objeto desconocido. El ovni queda reflejado en la capota del coche en una de las fotos. El ovni está dividido en dos mitades, así como la línea del árbol. La curvatura de las capotas normalmente no es homogénea, pero el ovni está aproximadamente en la posición esperada. El suelo parece estar reflejado en la base del objeto. Hay indicaciones para estimar el diámetro del ovni en 33 centímetros (1 pie) de ancho (el testigo habló de 2 metros de envergadura) y se encontraba a 11 y 18 metros de distancia. El fotógrafo elude cooperar con los investigadores y no quiere saber nada de los ovnis. Al parecer se trata de un ingeniero, por lo que podría estar capacitado para la realización de manipulaciones digitales. O el objeto podría ser un globo. O una nave espacial para alienígenas enanos o un aparato de reconocimiento, ¿quién sabe? Prometo ponerles al corriente en cuanto tengamos más información y el análisis esté concluido. Algunas estadísticas básicas extraídas del FOTOCAT. FOTOCAT reúne avistamientos definidos como ovnis sea cual sea el formato en que aparezca la imagen. Hay tres categorías generales: fotografía en papel con negativo corriente, diapositiva o foto digital, película de cine y grabación de video. Distribuido el catálogo por modo de imagen, resulta la siguiente tabla que resume el contenido de los 6.750 informes conocidos, según estén, además, resueltos (OVI) o no (OVNI). Como se aprecia, el 75% del total de informes archivados son de fotografías. Las películas sólo son el 4% y los videos suponen el 21%. En la actualidad, se siguen tomando fotografías (tanto digitales como analógicas), a pesar de la popularidad de los videos domésticos, pero las cámaras de cine son inexistentes desde finales de los ochenta. Los porcentajes de casos explicados apenas se diferencian si se trata de fotos o de películas (entre el 41 y el 37 por ciento), pero ese porcentaje desciende mucho en los casos de video (24%), probablemente porque al ser éstos más recientes, no han sido masivamente sometidos a análisis. Regularmente incluiremos algún trabajo relativo a fenomenología fotográfica anómala que juzgamos de interés divulgar. Un breve informe para el investigador serio y crítico. Fuentes de información seleccionada que juzgo de interés para adquirir conocimientos desde una perspectiva con orientación científica. ¿Quién no recuerda la película de la pretendida autópsia realizada sobre un pequeño extraterrestre panchudo y asexuado que se difundió en muchas televisiones del mundo en 1995? Se trató de un film mudo de 91 minutos que fue vendida con buen marketing por el distribuidor de videos londinense Ray Santilli y que se convirtió en pasto para consumo de las revistas sensacionalista del ramo, cuyos directores comulgaron con ruedas de molino y fueron -cuando lo fueron- tímidamente críticos con la producción cinematográfica que aludía a la operación improvisada hecha en 1947 de uno de los humanoides supuestamente hallados después de que un platillo volante se estrellara cerca de Roswell, en el desierto de New México (Estados Unidos). Roswell ha sido en las últimas décadas, junto con otros bluffs como Majestic 12, una de las temáticas que ha hecho correr más tinta en el submundo de la ufología, con el desperdicio de ingentes cantidades de tiempo por parte de los estudiosos, tanto los crédulos como los escépticos. Una de las razones de la evidente falta de progreso en la cuestión ovni es, precisamente, la lamentable pérdida de tiempo, energía y recursos de unos y otros en fantasiosos debates como éstos. Allí escuchamos como el padre de familia, descrito como un "piloto de la Fuerza Aérea", define la observación como "increíble". Lo que realmente resulta increíble es que ese ciudadano no conozca que en su localidad, cada año y con motivo de la festividad de San Judas Tadeo, se lanzan al aire por la noche globos que se elevan gracias a la llama producida por estopa impregnada en petroleo. Alrededor del globo, unos alambres sostienen una corona de luces ("veladoras") que contribuyen a su vistosidad. Los investigadores locales Raúl y Gustavo Alemán y Emilio Cetz, de la organización Visión-Ovni, realizaron una investigación que verificó la naturaleza del objeto que aparecía en el video. Hallazgos, por cierto, que confirmó personalmente Jaime Maussán en el aniversario del caso, el 28 de octubre de 2005. Agradezco a Carlos Martínez la información remitida. Estoy seguro que este espectáculo le resultará familiar a más de uno a quien le haya asombrado la visión de otros videos que muestran el vuelo de una congregación de resplandecientes ovnis redondos en los cielos mejicanos. William K. Hartmann, "Analysis of UFO Photographic Evidence", en el libro dirigido por Daniel S. Gillmor, Scientific Study of Unidentified Flying Objects (E.P. Dutton & Co., Inc., New York), 1969, páginas 84 a 85 y 437 a 455. Ann Druffel, Firestorm: Dr James E.McDonald's Fight for UFO Science (Wild Flower Press), 2003, páginas 271, 287 a 309 y 322 a 324. Ann Druffel, The MUFON UFO Journal, enero de 2006, páginas 3 a 7; y febrero de 2006, páginas 3 a 9. El problema que surge, en opinión de Tim, es que "cuando se ven en estéreo parece ser pequeño y cercano, en lugar de grande y distante". Este hallazgo ha iniciado una recomendable controversia de alta calidad en UFO Updates, que todavía no ha finalizado. Confío en que ello sea bueno para la práctica ufológica. Ann Druffel, la veterana ufóloga californiana me ha escrito hace días para confirmarme que ella está en posesión de los originales de las fotografías: "Rex Heflin me las confió poco después de recibirlas bajo extrañas circunstancias en los años noventa", me comentaba en un correo electrónico. Y es que, presuntamente, tres de las fotografías le fueron sustraídas al fotógrafo, para reaparecer 28 años más tarde tan misteriosamente como habían desaparecido. Este de Heflin es un avistamiento que consideramos todavía enteramente abierto para una renovada evaluación científica. El 5 de junio de 2006 fallecía en su casa de Placitas, New Mexico, Karl T. Pflock. En los últimos meses, Karl estuvo afectado por una rara y fatal enfermedad, la esclerosis lateral amiotrófica (ELA). Aunque desde hace bastantes años yo era buen conocedor de los escritos y derroteros ufológicos de Karl Pflock, nuestros caminos no se cruzaron hasta 1995, cuando le escribí por vez primera. Y fue una agradable sorpresa leer las primeras líneas de su pronta respuesta del 13 de septiembre de aquel año: "Naturalmente que estoy al corriente de tus importantes e interesantes aportaciones a la investigación ovni". Esta mutua familiaridad y respeto nos llevó a un apreciado intercambio de correspondencia, primero, y de emails, después, hasta pocos meses antes del fatal desenlace de su enfermedad. Correspondencia que incluye sonados juicios y opiniones acerca de personas y de situaciones que incidentalmente tuvimos en común durante ese intervalo de tiempo. No pretendo escribir ninguna crónica necrológica, ni de la acción ufológica ni de los libros de Pflock. Se trata simplemente de darme una excusa para releer sus cartas, recordar un par de cosas y mencionar algo de su bibliografía más recomendable, especialmente para quien no lo halla conocido. En primer término, señalar que Karl Pflock fue un empleado profesional de la CIA durante 6 años y eso le hizo ser víctima de insinuaciones sobre una imaginaria oscura trayectoria en cuanto a los ovnis se refiere, actividades encubiertas demás, las cuales él trató de despejar con buenas dosis de sentido del humor y con artículos como "I was a ufologist for the CIA" (Fui un ufólogo para la CIA), publicado en la revista UFO de noviembre-diciembre de 1993, páginas 25 a 30, o solicitando al departamento de personal de la propia Agencia Central de Inteligencia que certificara por escrito que su empleo en la agencia comenzó el 11 de septiembre de 1966 ¡y terminó el 31 de marzo de 1972! (ver documento anexo). Pflock era un brillante analista de estrategias, una persona sumamente inteligente y un investigador concienzudo y un escritor metódico. Escribió mucho, por ejemplo, sobre el mito de Roswell y su último informe es una pieza maestra, se titula: Roswell. Inconvenient Facts and the Will to Believe (Roswell: Hechos inconvenientes y el deseo de creer), que fue editado por Prometheus Books (Amherst, New York, 2001). Tuvo que haberse divertido enormemente mientras colaboraba con James W. Moseley para escribir al alimón un libro titulado Shockingly Close to the Truth! (¡Espantosamente cerca de la verdad! ), publicado por la misma editorial el año 2002, una especie de libro de memorias de Jim Moseley y también un entretenido texto para los estudiosos de la cultura popular. Karl, echaré de menos tus agudas valoraciones y detallados análisis de los asuntos ufológicos. Facilitaremos listados de casos regionales, provinciales o nacionales para su revisión, corrección y ampliación. Para aquellos lectores que residan en Valencia y quieran realizar trabajo voluntario, les invitamos a escribirnos.